History tells us that matches against Bicester are close, well fought affairs and with each team recording an away win against the other already this season, another close encounter was expected. In front of a sizeable crowd, Bicester kicked off proceedings. The opening exchanges supported the view that this would be another close match between two well matched teams. After a nervy opening ten minutes, Charles Howard broke through the Bicester defence to score under the posts, with Cian Gerber adding the conversion. This score seemed to settle the Banbury nerves and they started to play their patterns. 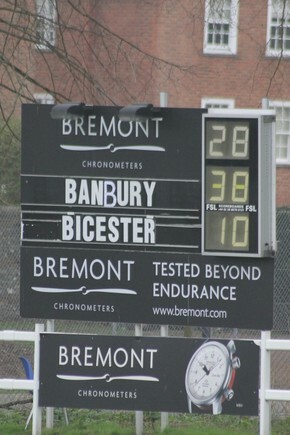 Bicester were unable to make much progress in the Banbury half of the pitch, and Conner Capell extended the Banbury lead with another try under the posts which was converted by Cian Gerber. As the clock was ticking down to half-time, Charlie Cranley crossed for Banbury's third score with Cian Gerber continuing his good form from the tee to give Banbury a 21-0 lead at half-time. The half-time team talk seemed to invigorate Bicester and, following a kick to the corner from a penalty, the forwards drove over in the corner for their first try despite the efforts of the Banbury defence to hold them up. The tricky conversion from the sidelines was missed, but Bicester were back in the game. From the restart, Banbury restored their 3 try advantage with Charlie Cranley crossing near the posts for his second try of the match, followed by another Cian Gerber conversion. Bicester hit back with their second try which was a carbon copy of the first, with the Banbury defence unable to repel another driving maul into the corner, with another tricky conversion attempt falling short. Banbury continued to press and Charlie Cranley was unlucky not to claim a hat-trick when he was adjudged to have put a foot in touch in the buildup. Not to be denied, Cian Gerber scored Banburys fifth try and added the conversion to make the game safe. With the clock ticking towards full-time, a Bicester player saw yellow for a high tackle and Cian Gerber kicked the ensuing penalty to take the final score to 38-10 to Banbury and his own personal tally to 18 (including a 100% return from the kicking tee).